The entire mining sector in South Africa is vulnerable to climate change and to job losses as a result of the biophysical impacts, international trade responses and adaptation efforts to address it. The South African mining sector revolves around the mining of coal and lignite, diamonds, gold, platinum, ferrous, non-ferrous, and other precious metals and minerals. Coal and lignite mining is the most vulnerable to the impacts of climate change, and is expected to face close to 6% job losses by 2030. 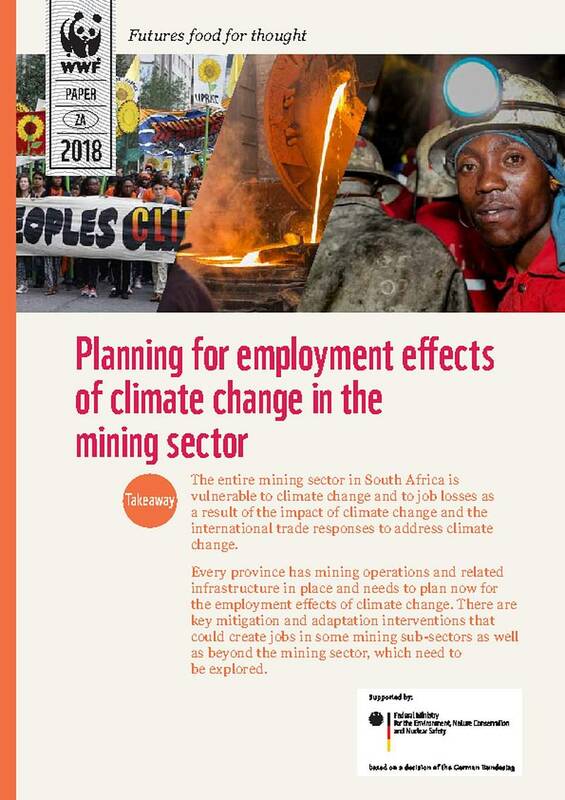 Every province has mining operations and related infrastructure in place and this Futures Food for Thought paper argues that plans must be made now for the near future employment effects of climate change. There are key mitigation and adaptation interventions that could create jobs in some mining sub-sectors as well as beyond the mining sector, which warrant exploration.